I am originally from Florida and was visiting some family in Winthrop, Washington recently. My cousin mentioned an organic restaurant called the Arrowleaf Bistro and the organic foods that they offer. I have always been an avid fan of organic foods, and was happy to hear there was an organic food restaurant near my cousin’s home. The organic foods they make contained fresh organic ingredients. As you would expect in organic restaurants, the menu prices where a little more expensive than traditional restaurants. But it’s well worth it, considering the benefits of organic food, not to mention mouthwatering meals! I ordered the Cowboy Steak and it was extremely delicious. I highly recommend this plate if you are looking for good organic meat to have for dinner. Overall, I was very pleased with this restaurant and recommend it for those individuals who are looking for a great organic food restaurant experience. I recently moved to Salt Lake City and have found one of the best vegetarian, organic restaurants I've ever been to. Sage's Cafe is in downtown Salt Lake within walking distance from my house and I just love it. They have a wide and varied menu, but my favorite is breakfast and I tend to always get either the French toast or the crepes. 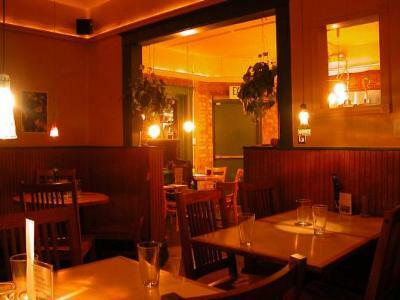 They have outstanding salads and sandwiches, plus a fantastic weekend brunch. Not only does Sage's Cafe create great food, but they do it by buying locally and making their meals from 90% organic foodstuffs. If you live in Salt Lake City or are planning to visit, I would highly recommend checking out Sage's Cafe as a great place for high quality, organic food at a very reasonable price. Evos Organic Cafe - Healthy Organic Fast Food! 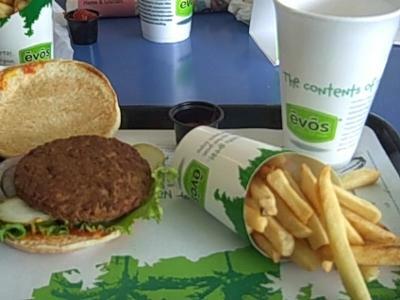 I was a bit curious when I saw the flyer boasting this healthy organic fast food cafe in Las Vegas called Evo's. This is rare for Las Vegas since most restaurants here are chains in the fast food genre. Evo’s is organic fast food. I was impressed by Evo's ketchup bar with 4-5 different flavors including spicy and garlic flavors. That was a perfect side to their boasted tasty Airfries, their baked and healthier option of French fries (with half the fat). Their menu has a wide range of options from burgers, wraps, soy options and even a healthy kids menu! While the price was on the higher end for a cafe (versus sit down restaurant) it was worth having organic foods and healthier options. Finally, in terms of ambiance, it's a mix of hipster and futuristic. The colors are whites, neons, and lime green. While I wouldn't decorate my house with these colors, they make it work. If anything, it adds to the experience. I would recommend Evo's organic fast food and know they have locations in California and the East Coast as well. With 50-70% less fat both your heart AND taste buds will benefit, so don’t pass this up!